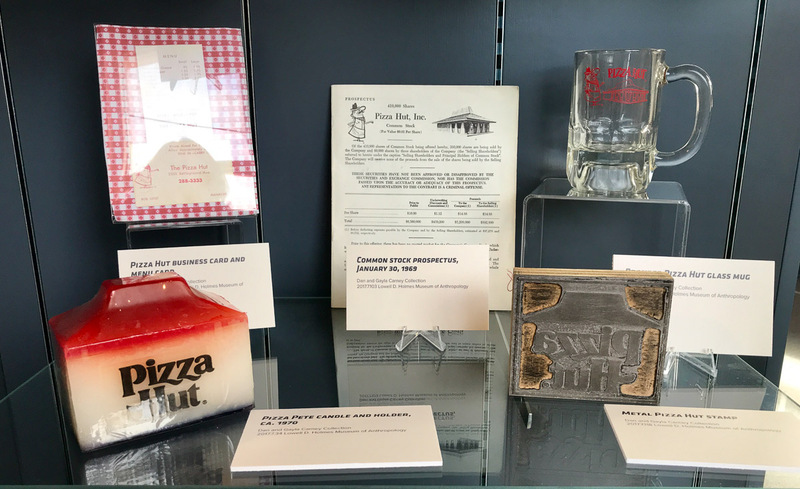 A museum dedicated to the historical, cultural and entrepreneurial story of Pizza Hut opened Wednesday in the building that housed the first restaurant launched by founders Dan and Frank Carney. The structure was relocated in 2017 to the Innovation Campus at Wichita State University, the Carneys’ alma mater. The grand opening was marked by a ribbon-cutting ceremony, remarks from dignitaries including Dan Carney, and a celebration with pizza and refreshments. Among those attending were Pizza Hut franchisees and other donors who contributed to the $1.2 million fundraising campaign for the museum, initiated by the WSU Foundation. The museum will be open to the public beginning April 30. WSU students in disciplines such as the humanities and social sciences have contributed to the creation of the museum and will continue to have applied learning opportunities as museum docents and curators and in marketing. Dan and Gayla Carney donated most of their collection of memorabilia displayed in the renovated, 500-square-foot building. Carney praised Wichita State and the museum designers, Flint Hills Design of North Newton, for capturing the Pizza Hut story so successfully. 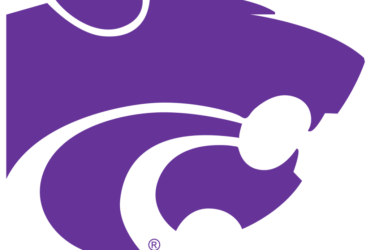 Among the franchisees donating to the privately funded project was Bill Walsh and his Wichita company, Daland Corp. Walsh was a WSU freshman in 1966 planning to major in English when he began managing a Pizza Hut restaurant and decided to change his major to business. “Hopefully, today’s business students and others will see that the incredible Pizza Hut brand was started in this humble building by two brothers whose entrepreneurial spirit built a worldwide icon of restaurant franchising,” Walsh said. Other donors included Larry and Dana Fugate of Fugate Enterprises and Pizza Hut LLC. 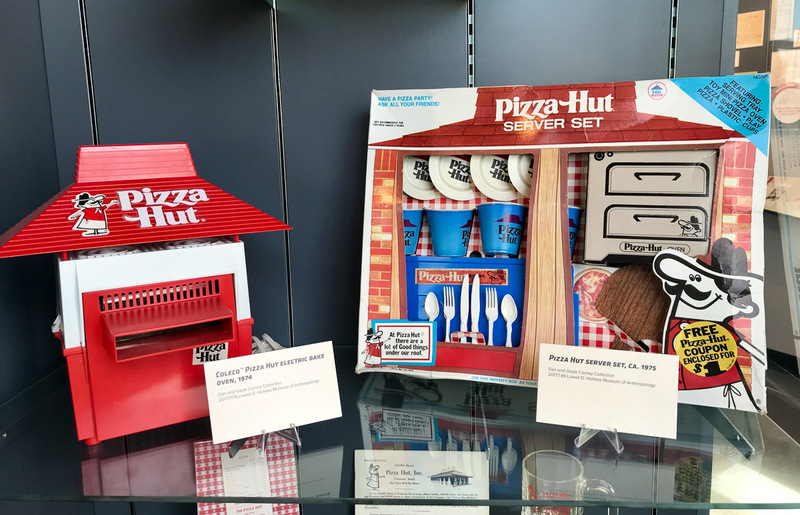 The WSU Foundation launched an initiative in 2016 to relocate the original Pizza Hut building to the Innovation Campus and to create a museum honoring not only the Carneys, but also the entrepreneurial drive that has defined Wichita for much of its history. Borrowing $600 from their mother, the Carneys opened their first Pizza Hut in 1958 in a small building at the corner of Bluff and Kellogg. At the time, Dan was a Wichita University graduate and Frank was still enrolled. The brothers took a gamble on pizza, then relatively unknown to most diners. Just a year later, they expanded into franchising. Pizza Hut went international in 1970 and, in 1977, the brothers sold it to PepsiCo for $300 million. Pizza Hut today is a subsidiary of Yum! Brands, one of the world’s largest restaurant companies. The original Pizza Hut restaurant was first moved to the WSU campus in the 1980s. It had various uses but, in more recent years, had stood vacant and unused before being moved to the Innovation Campus. 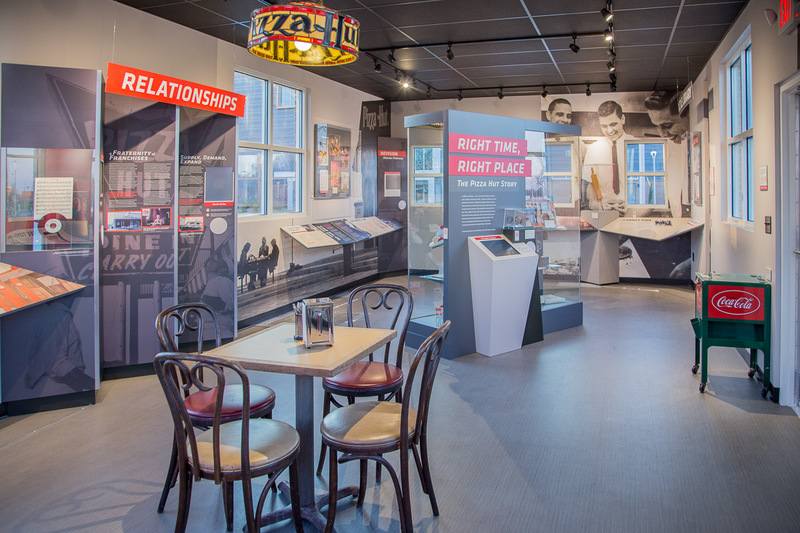 Though small, the museum is packed with displays, interactive features and artifacts, including a café table under a vintage light fixture and a cutout of the Pizza Pete icon. Visitors will be able to watch early TV commercials, learn about Pizza Hut’s famous Book It! program and view mementos such as early menus, promotional items, serving trays, glassware and more. 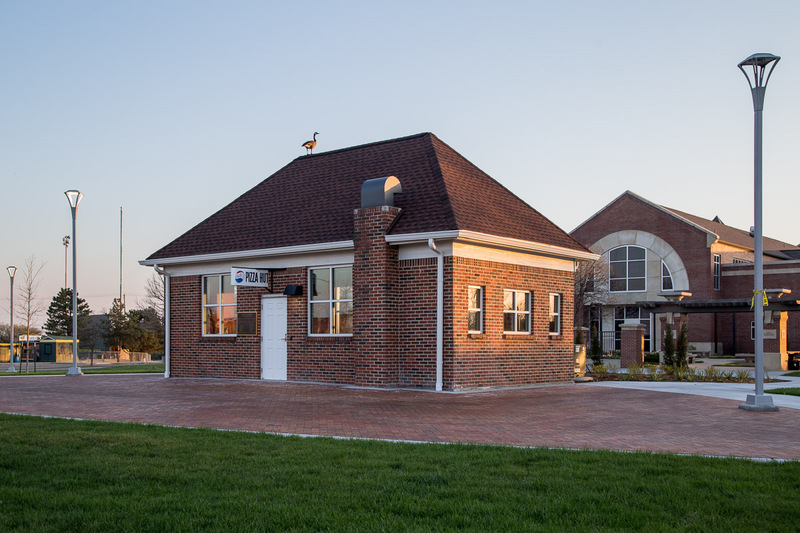 The museum, located just south of Marcus Welcome Center, will be open to the public during set hours and also available for group tours arranged in advance. Next week, hours will be 9 a.m.-4 p.m. Monday and Friday and noon-4 p.m. Tuesday-Thursday. Beginning May 7, summer hours will be noon-4 p.m. Monday-Friday.